I've had this cookie on my mind for about a month, and on my computer for about two weeks. 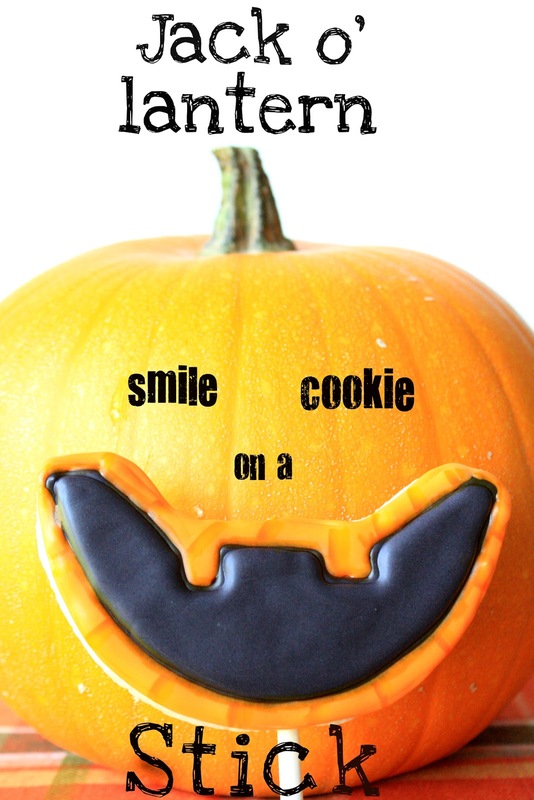 I had planned on making the smile cookie solely black, but decided to add a little pumpkin flesh for some color. I also detailed around the black using orange and yellow edible markers (AmeriColor). This little pumpkin enjoyed it:) Can't wait till ALL the little pumpkins are here next month!!! were made with this sugar cookie recipe and royal icing. 1. Mix up a batch of sugar cookies (with recipe mentioned or your own). 2. 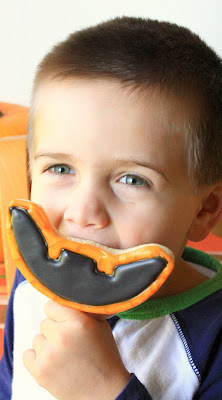 Make a Jack O' Lantern smile template on a heavy piece of paper, and cut out. 3. Roll out cookie dough and place template on dough, cutting around it with a small, sharp knife. 4. Place cut out cookies on a baking sheet (I make sure the dough is chilled/firm, and transfer to baking sheet with a spatula). Be sure to leave room for the cookie stick to be inserted. 5. Insert cookie sticks into cookies and bake. 6. Let cookies cool on baking sheet for a bit and then transfer to cooling rack to cool completely~When moving to cooling rack, support the cookie at the point where the stick and cookie meet. 7. Working about a 1/2-inch from the edge, outline the "smile" with black icing. 8. Let dry for about 15 minutes and then fill in with black icing. 9. When the black is completely dry, otling all the way to the edge with orange royal icing. 10. Let it dry for 15 minutes and then fill in with orange icing. 11. Let dry completely, overnight is best, if adding edible marker details. Great idea...my boys would love this!! Totally fun. My kids would love these!!! That is the cutest little pumpkin ever! I am definitely going to make some of your cute stick cookies. My daughter (oldest) who is married and has 3 kids has learned to love making floated sugar cookies now that I have started blogging and last time she took all the extras home with the bottles of frosting and her kids had fun designing their own. You are always so inspiring. We both feel it is so restful to sit and frost the cookies. That cute "pumpkin" must be Munchin #3. Oh, and the cookie is a close second. I love the texture that the orange and the markers create. They really make the black pop. Your grandchildren must adore you and your wonderful baking! So cute. What a SWEET treat for the grands! Sue I am in love with these! I feel compelled to make them immediately for my son's fall party. LOVE THEM!!!!! o Sue...you are so talented! I love those cute cookies! They make me SMILE! These are such a clever idea! So cute! Haha funny and cute! I love your creativity/sense of humor! Just discovered your blog via Pinterest and I love this cookie idea! What drew me to your blog in the first place were your awesome pie fries! A must to make since my munchkin is a pie crust fiend. Love it... you always have the cutest treats! This is just brilliant. How fun! now that is FUN....SWEET style! Ah! Sue you are so clever! LOVE these pictures! Oh my...these are completely adorable!! Those are so so cute! Pin! What a fun idea! I love seeing how you celebrate holidays with your oven. These are adorable! Super cute. So cute, we're in full Halloween baking mode around here. Another cute treat to add to the list. Thanks for sharing!! How exciting to have all your *little pumpkins* visiting next month. This smiling one in the above photo is a little cutie and your smiling pumpkin mouth is a great idea. So so cute, Sue!! Loved the orange edging. Such a fun idea for a halloween cookie! So adorable and they look like such fun! They're gonna be featured on this week's Sweets for a Saturday. As much fun to play with as to eat! Fun idea! Hello! Thanks for visiting my blog. Please feel free to leave a comment or just say HI. I'd love to hear from you:) Your comments are "the icing on the cake". I enjoy living on the beautiful central coast of California and making munchies for the munchkins, and others:) Blogging offers another venue to stay connected with far-flung family and friends(and make new ones). Plus, it's fun! Your comments are "the icing on the cake!"